Every Thanksgiving, there are the true "Turkeytarians" like my mom and my husband who start dreaming of turkey and all that it entails. We've always joked that if my mom were on Death Row, turkey & dressing would be her last meal request. My husband is the official turkey guy. He brines it, he roasts it, he watches it, he even photographs it. Yep, I'm not the only nerd taking pictures of food. Personally, I'm very (extremely) lukewarm about turkey. But, I get it. There are those like Mom and Neil who are all in. I know people like them think that a turkey, mayo and tomato sandwich later is like manna from Heaven. Whatev. Me, I'm the one thinking of all the ways I can turn that leftover turkey into something way more interesting. Soup, enchiladas, pot pies, something. 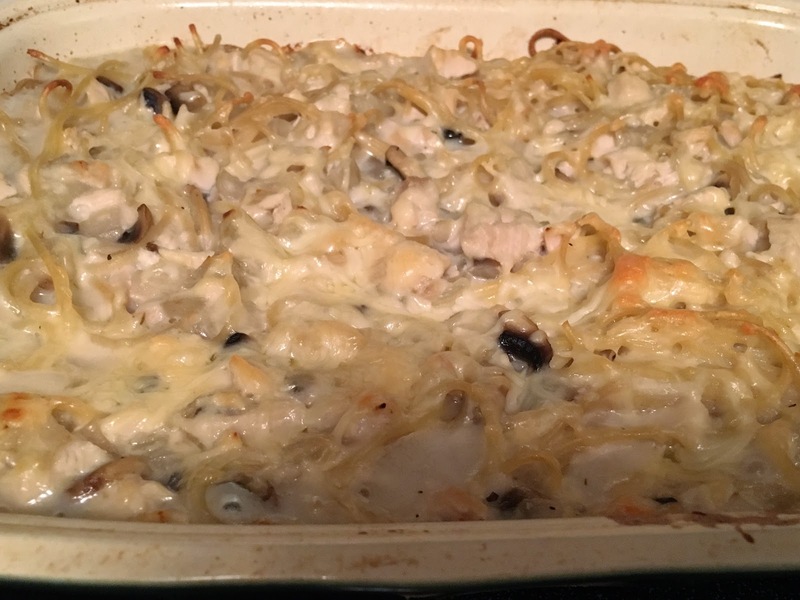 This year, I decided on an old classic....Turkey Tetrazzini. Start by cooking about 1/2 lb of noodles, whatever type you like. 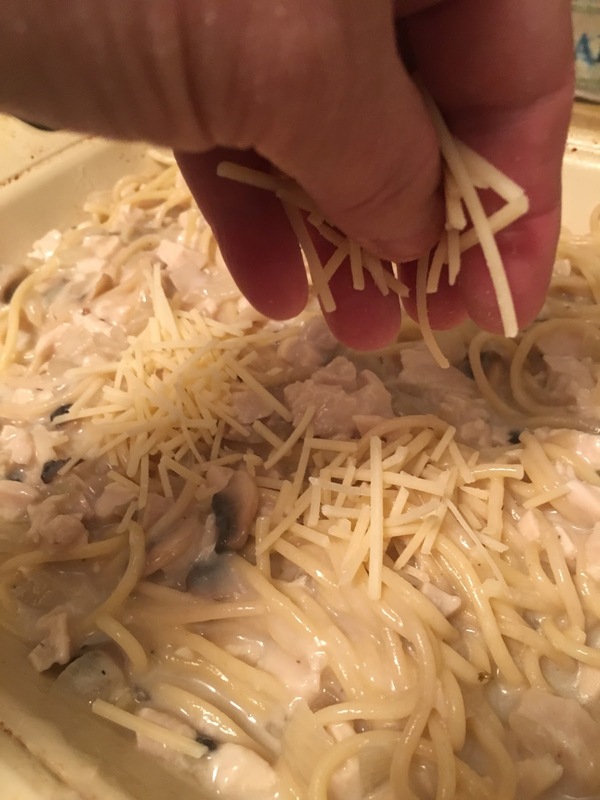 I chose spaghetti but linguine or fettucine would work well too. 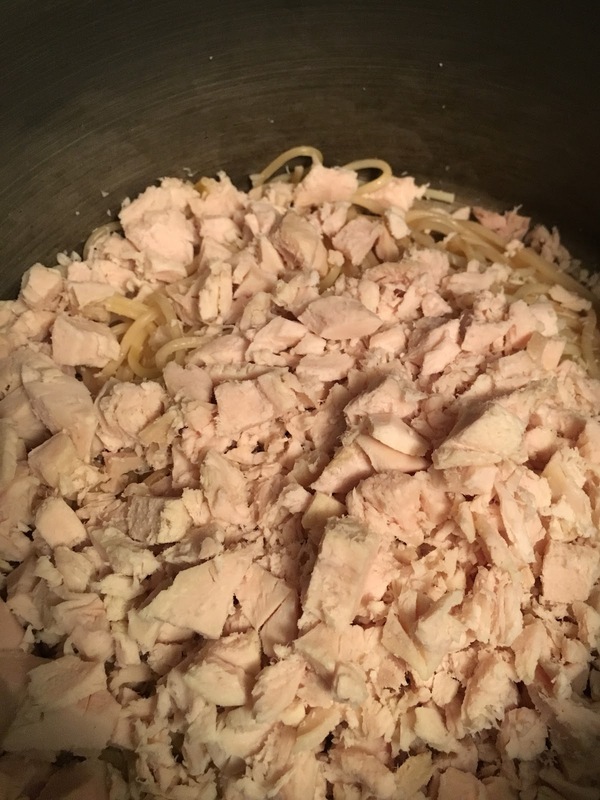 Chop about 3 cups of leftover turkey. I'm not a big fan of cubes of meat, so I chop mine roughly so the pieces are not uniform. 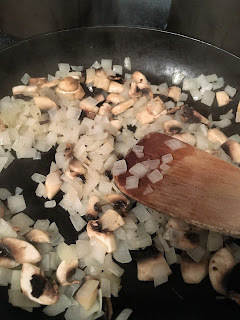 Chop up a small onion and some mushrooms. I used about 4 big mushrooms; you can decide how many is enough but not too much. Go ahead and preheat your oven to 400. Let's make the sauce now. 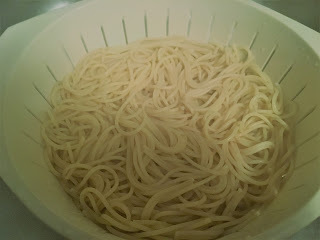 In a saucepan, melt about 3 Tbs butter. Stir in 1/4 cup of flour and cook about 3 minutes or so. 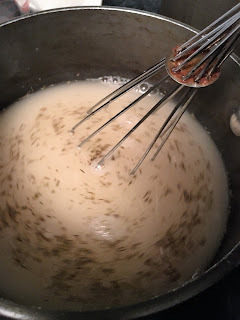 Whisk in 2 3/4 cup chicken or turkey broth, 1/4 cup white wine, 1/4 tsp thyme and a pinch of nutmeg. Whisk until nice and smooth and continue to heat to boiling. Reduce heat and simmer for about 5 minutes, whisking frequently. Remove from heat and whisk in cream. Set aside. Melt about 1 more Tbs butter and saute onions and mushrooms. 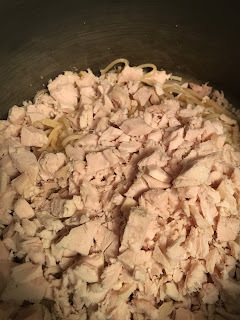 Mix together turkey, noodles, onions and mushrooms. 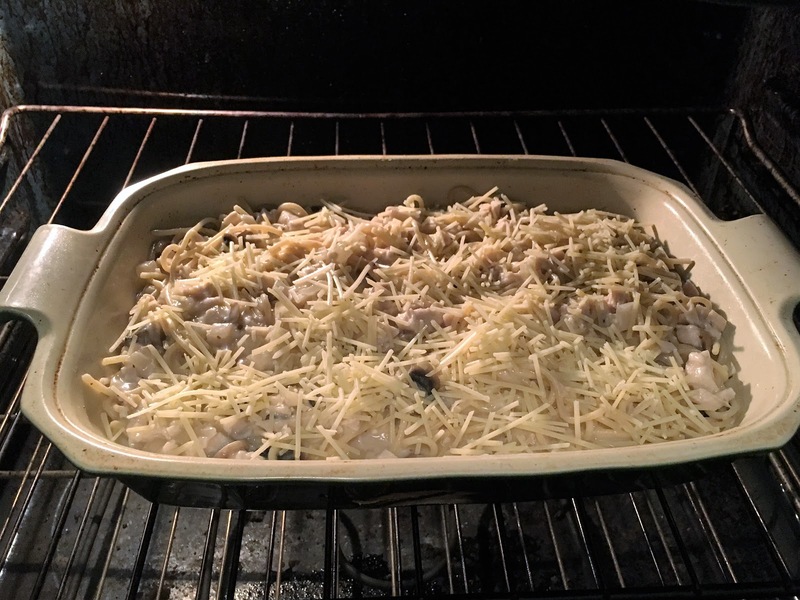 Then into that nice, hot oven to bake for about 30 minutes, until bubbly and beautiful. 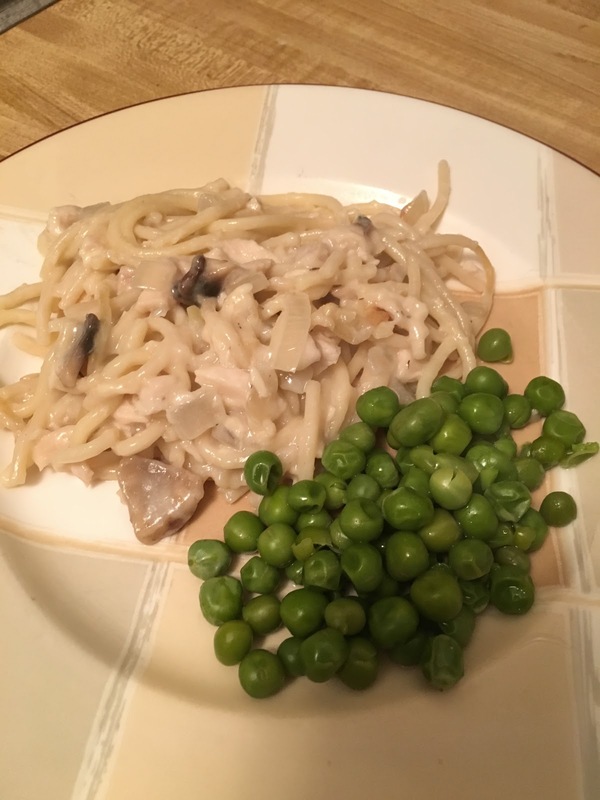 I served ours with some peas because I'm a freak about having something green on the plate. 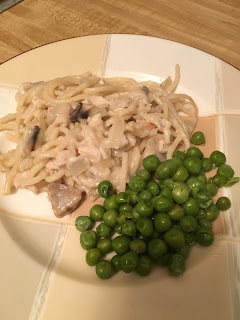 Actually, the peas are good mixed into the tetrazzini too. I've also added pimento for color in past casseroles, which works well too. I realize tetrazzini is probably the most 1950's type meal you can imagine, but it has stood the test of time for a reason. 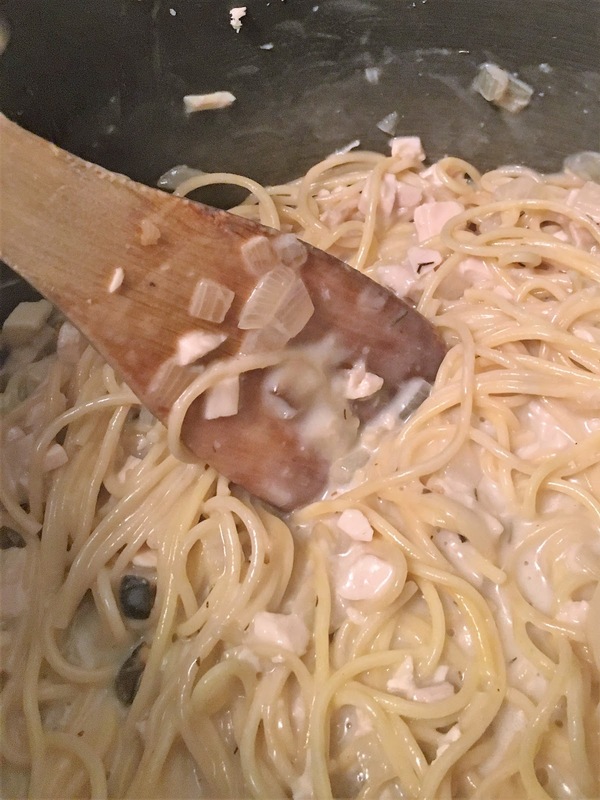 It's creamy and gooey, there's pasta involved, it uses up that leftover turkey (or chicken), it freezes well and is a good dish to take to a sick friend. Frankly, I find it more exciting than a leftover turkey sandwich. But then again, I'm not a textbook Turkeytarian like Mom and Neil!